We have made a list of the most notorious hotel scams you need to watch out for when you next go on holiday. Before you even get to your hotel you may become the victim of a scam. There have been a growing number of reports of taxi drivers that try to convince tourists that the hotel they want to go to is either fully booked or closed. This is a blatant attempt to lure you to another venue that will be described as having better quality and value than the one you have already booked. Always plan ahead, confirm reservations before you go, and make sure you know how long the drive will take between the airport and your hotel so you don’t get overcharged. Some hotels will be able to recommend taxi companies in advance of your trip. Now that you have made it to your hotel and go to check in, the receptionist tells you that the hotel is full despite having booked in advance. It may be the middle of the night, or you may have stepped off of a long haul flight, so when they offer to take you to another one of their hotels that is the same, if not better quality, you may be tempted to go. Don’t! This is what is known as ‘getting walked’. If you have already made a reservation, the hotel must honor it. Never take no for an answer. Once you arrive at the right hotel, check in and head to bed to get the first good nights sleep of your holiday, you may get rudely awoken by a call from the front desk. The person on the other end is apologetic and informs you that there has been a problem with your payment, and that you need to confirm your credit card details. You may be jet lagged, or under the false sense of security that the only person who knows you are in your room is the person who checked you in at the front desk. This is not the case. Thieves get the direct dial to hotel rooms and use it to steal your card details. Never give this information over the phone. Always head to the front desk where you can view their computer screens. This last piece of advice can be used in all locations. When you’re on holiday its essential that you turn off data roaming to avoid charges. To keep up with emails and Facebook, free hotel Wi-fi is the perfect solution. The only problem is that thieves are setting up fake hotspots under the pseudonyms of the hotels you are staying in. To make sure your card details and personal information remain secure, always check at the front desk to find out exactly what the Wi-fi is called and how to use it securely. 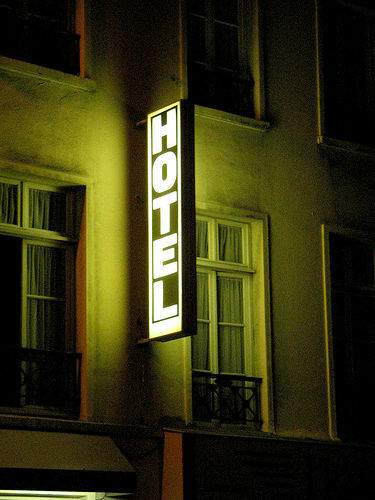 If there are any hotel scams that you have experienced, let us know about them in the comments section below. About the author: Hayley Brown blogs for Holiday Gems – the cheap holiday specialists.